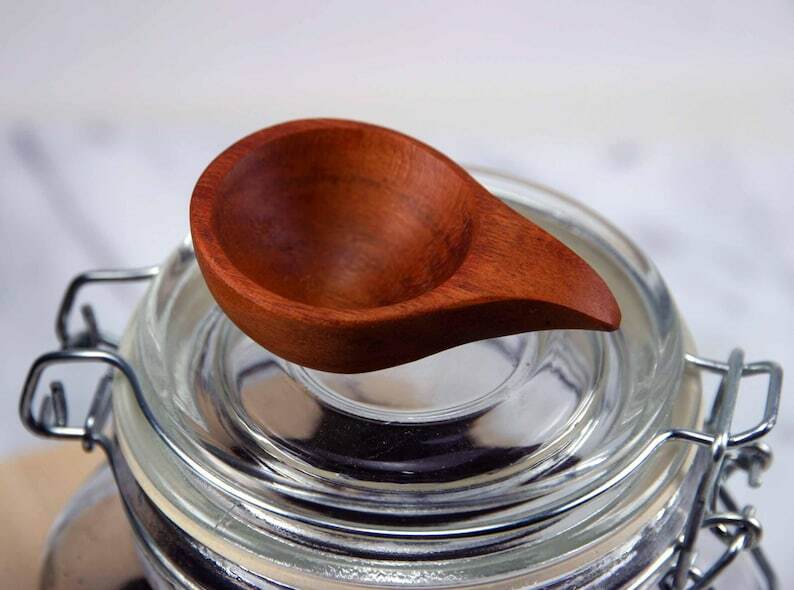 Coffee scoop is 2-3/4 inch long 1 3/4 wide in cherry, also made in walnut. 1 tablespoon, weighed and calibrated with sugar for an accurate size. I started putting a groove under the bowl, so your index finger will fit and the thumb on the top. Perfect to leave in coffee container. Spoon has been washed to raise the grain, then re-sanded and waxed with beeswax and mineral oil mix. Regardless of what some spoon makers say grain raises all the time after use. The grain will break, then fuzz up. Gifted this little scoop to my sister who really liked it. Super short scoop with an appropriate measurement. Wow! the shipment was very fast, he even shipped it right after the Christmas day, and the package came with very cute metal container including beeswax to take care of the cute spon. I will this container for my lip balm later 😍the spon is very functional I never seen a style like this before, even my mom fall in love with it. Definitely I’m going to buy more from his beautiful store.